Johnny Locker is the leader of a popular movement to overhaul the Social Security system and ensure that citizens get the money that is due to them. But when he's whisked away from the Capitol steps during a march on Washington, D.C., Johnny is suddenly thrust into another much bigger, more dangerous movement to overthrow the entire government. 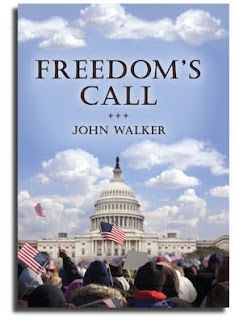 Freedom's Call by John Walker is a page-turner from the start. And at 177 pages, it's a short, easy read. This isn't a complex thriller with lots of twists and turns, but Walker kept my interest ~ and kept the story moving along ~ from beginning to end. It's an interesting look at how even those with good intentions can become corrupted by too much power. And it's a story about the importance of ordinary citizens taking a stand and supporting one another in the wake of a disaster. The only issue I had with the story is that Walker doesn't acknowledge the presidential line of succession, but as this is a work of fiction, I'm okay with that. I also don't completely agree with the government structure that he puts forth as the solution. But I liked the characters, particularly the character of Johnny Locker, who I kept picturing as Walker himself. And I enjoyed the story he told. John Walker is a retired broadcaster and music producer. With forty years of experience in the radio and music industry, he built and operated White Rabbit Productions, a recording studio in Salem, Oregon. His work in broadcasting has garnered a National Silver Microphone Award, and during his twenty two years at KINK Radio, he was instrumental in earning the station a prestigious Marconi Award. Walker currently runs 3db Productions, and lives in Dillon, Montana. For more information about Freedom's Call and author John Walker, visit www.authorjohnwalker.com/. This review was written based on a copy of Freedom's Call that I received from Phenix & Phenix Literary Publicists.